Credit: Argonne Laboratory. Click for full view. The image above is a timeline with each frame showcasing a stage in our Universe’s evolution, from humble beginning to present date (left to right), as simulated by the Argonne National Laboratory. Called the Q Continuum simulation, this is the most complete cosmological simulation to date covering a volume of 1300 Mpc on a side (one Mpc = 3.08567758 × 1022 meters) where half a trillion particles evolved for a mass resolution of ~1.5×108 Msun. The Q Continuum basically imitates the evolution of our universe over the last 13.8 billion years, using data fed by latest generation of high-fidelity sky surveys and crunching it into models of the universe that are larger, higher-resolution, and more statistically accurate than any that have come before. The ultimate goal of these simulations is to unravel the fundamental origin of the universe and nature of dark matter and dark energy. The two are undetectable directly, but together make up 95% of all matter in the Universe. It’s an immense challenge, but work like this is what might finally lead to a breakthrough. Halo particles in the Q Continuum simulation at z = 0. Shown are a sub-sample of 1% of all particles in halos of mass and above. Halos with less than 500 particles are represented by 5 particles. The first image (left upper corner) shows the full volume; the inset box volume is shown in the next image (upper middle) and so on. 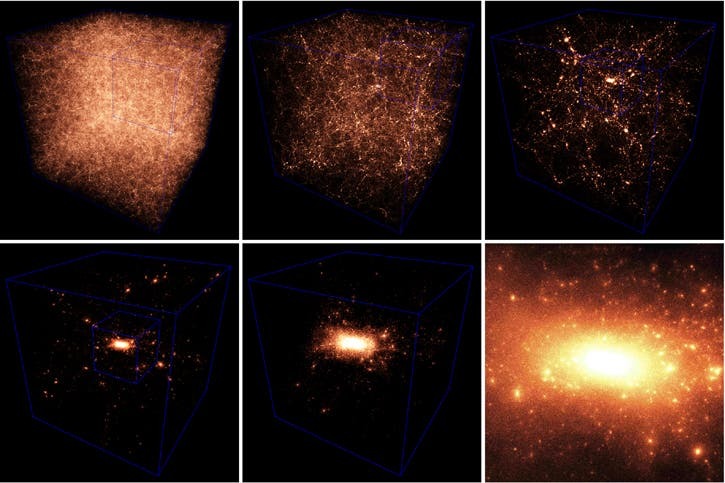 The series of images zooms into one of the very largest clusters in the simulation, shown in the last two images (lower panels, middle and right). Overall, approximately 46% of all particles reside in halos with 100 or more particles at z = 0. This simulation was carried out on Titan, a GPU-CPU system located at Oak Ridge Leadership Computing Facility which is currently the second fastest machine in the world. As you might imagine, it was so intense that it used up 90% of the full machine to achieve the high mass resolution in a large cosmological volume. You can read more about the simulation in the published paper.